Tidepool scenes of vibrantly colored sea stars could become a rarity as the Sea Star Wasting Disease spreads. Photo of Pisaster ochraceus sea stars: Photo credit: Kevin Lafferty, USGS. A prime suspect has been identified as a probable cause of the "Sea Star Wasting Disease," a mysterious epidemic that has been killing these animals in droves along the U.S. and Canadian Pacific Coast. Researchers from Cornell University, the U.S. Geological Survey (USGS), and other institutions published their findings on this "sea star associated densovirus (SSaDV)" in the December 2014 issue of the Proceedings of the National Academy of Sciences (PNAS). The sea star mortality was so sudden and unprecedented that biologists were unprepared and short on resources, says coauthor Kevin Lafferty, a USGS parasite specialist who led the statistical analysis for the new study. "Lots of people were scrambling to learn what was going on. Ian Hewson at Cornell started having interesting findings with densovirus, so he and Drew Harvell [Cornell] helped pull together a team of interested scientists to contribute to the effort." Sea star die-offs have been observed in past decades, but none were at this geographic scale. Since June 2013, Sea Star Wasting Disease cases have been reported from Baja California all the way to southern Alaska. 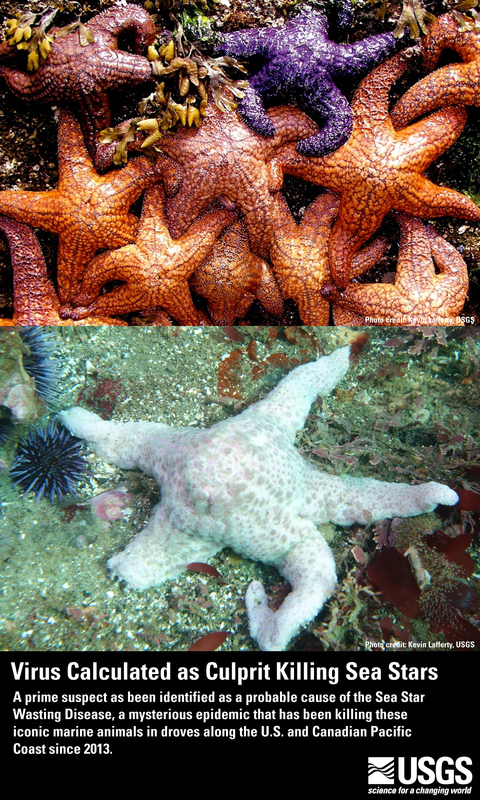 As many as 20 sea star species have been affected. To pinpoint the suspected biological agent, Cornell researchers devised a laboratory experiment using sunflower sea stars (Pycnopodia helianthoides) that showed symptoms of Sea Star Wasting Disease. Tissue samples were removed from sick animals, minced and blended in seawater. This slurry was then passed through super-fine filters designed to remove debris and bacteria but allow smaller particles —including viruses—to pass through. This filtrate was then injected into healthy sea stars, which all began to show wasting symptoms after 2 weeks. Researchers then took tissue from this set of newly diseased sea stars to create a second filtrate, injecting this into yet another group of healthy sea stars—and these sea stars also showed wasting symptoms after 2 weeks. A control group of healthy sea stars was injected with a version of the original filtrate boiled to destroy any biologically active material—and none of these sea stars developed wasting symptoms. The experiments proved that some sort of virus-sized, biologically active entity could be collected from sick sea stars and trigger wasting symptoms in one sea star after another. 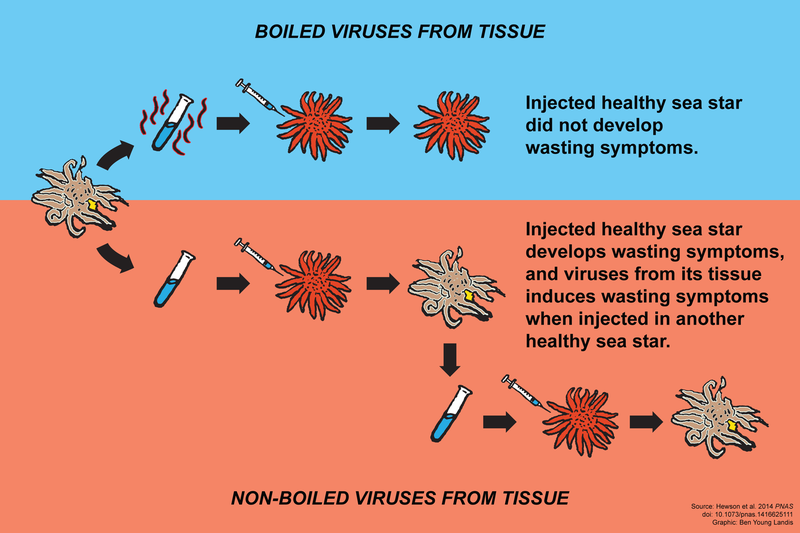 "We went back to the tissues from these sick and healthy sea stars to obtain virus particles and sequenced the genomes to uncover the types of viruses present," says Hewson, the Cornell microbiologist and the study's senior author. "The sick animals had a higher prevalence of one viral group. We were able to assemble a near-complete viral genome from the predominant virus in the sick sea stars resulting in the identification of a densovirus genome new to scientific record—and gave it a name: 'sea star associated densovirus,' or SSaDV." More tests are needed to confirm SSaDV as the infectious agent and to understand its disease mechanism. SSaDV, along with a sea urchin virus from Hawaii that Hewson's team recently identified, are the first-ever viruses identified in echinoderms. Intriguingly, populations of collector urchins (Tripneustes gratilla) in Hawaii have also had unusual mortality in the past year. Researchers have detected genome sequences of SSaDV in sea star specimens from the 1940s, suggesting that the virus has been prevalent in the ecosystem all this time, adding to the mystery of the current epidemic. More research is needed to understand the disease ecology of this agent in its marine host and how the deaths of millions of sea stars will change their local food webs. Harvell was supported by a National Science Foundation grant for a Research Coordination Network for the Ecology of Marine Infectious Disease, while Hewson received rapid response funds from Cornell University's Atkinson Center for a Sustainable Future. Lafferty received fundng from the USGS Wildlife: Terrestrial and Endangered Resources Program. 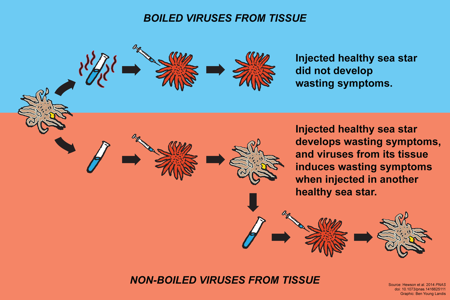 A simplified diagram of the Sea Star Wasting Disease experiment devised at Cornell University, used to prove that a virus-sized, biologically active entity was triggering wasting symptoms in sea stars. Graphic: Ben Young Landis, USGS, based on Hewson and others, 2014. Densovirus associated with sea-star wasting disease and mass mortality: Proceedings of the National Academy of Sciences, 2014, v. 111, no. 48, pp. 17278-17283, doi:10.1073/pnas.1416625111. Discovery of urchin-associated densoviruses (family Parvoviridae) in coastal waters of the Big Island, Hawaii: Journal of General Virology, 2014, v. 95, no. 3, pp. 652-658, doi:10.1099/vir.0.060780-0.